On July 28th, the Ukrainian Greek-Catholic Church celebrated the Feast of the Saint Equal to the Apostles Prince Volodymyr. The Pontifical Divine Liturgy in the Patriarchal Cathedral of the Resurrection of Christ in Kyiv was led by the Father and the Head of the Ukrainian Greek-Catholic Church His Beatitude Sviatoslav (Shevchuk). Concelebrants with UGCC Head of the Liturgy were: Bishop Ihor (Vozniak), Archbishop and Metropolitan of Lviv; Bishop Volodymyr (Viytyshyn), Archbishop and Metropolitan of Ivano-Frankivsk; Bishop Vasyl (Semeniuk), Archbishop and Metropolitan of Ternopil-Zboriv; Bishop Mykhaylo (Koltun), Eparch of Sokal-Zhovkva; Bishop Dmytro (Hryhorak), Eparch of Buchach; Bishop Stepan (Meniuk), Exarch of Donetsk-Kharkiv; Bishop Josaphat (Hovera), Exarch of Lutsk; Bishop Bohdan (Dziurakh), Secretary of UGCC Synod of Bishops; Bishop Joseph Milian, Auxiliary Bishop of Kyiv Archeparchy. 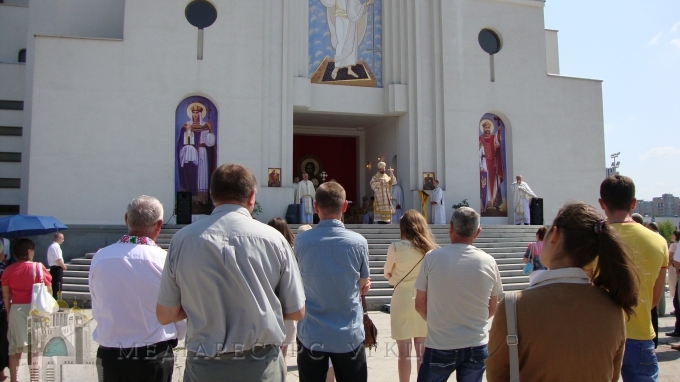 “Today, here at the foot of the Patriarchal Cathedral of the Resurrection of Christ that is being readied for the blessing, I want to thank God for the gift of faith through the life, service and the deed of the Equal to the Apostles Great Prince Volodymyr,” said His Beatitude Sviatoslav during the sermon. He noted that each Christian nation has that first one – an apostle or one equal to the apostles – preacher who brought the light of Christ’s faith to that nation on this earth. “We, Ukrainians, have our Equal to the Apostles Prince Volodymyr, whose memory we want to honor in a dignified manner today, especially with this celebratory Pontifical Liturgy,” added the Church Primate. The preacher reminded the faithful who was Prince Volodymyr. “As a pagan, Prince Volodymyr believed in the cult of force. This cult was the content of pagan religion, personifying the gods of the Slavic tribes. Through the cult of the sword in his time Volodymyr wanted to unite Kyivan Rus. That cult demonstrated itself even when he wanted by force to conquer a woman, demanding for a wife the sister of the Constantinople emperor. He thought that force, sometimes brutal, is that god which is worth adoring worshipping. Maybe, at the peak of achieving this force he suddenly comprehended his helplessness there, in front of the walls of Kherson. Then he got to know another God who was worshipped by Christians -- that God who is Love. And he, a mighty ruler, rejected force in order to love and began to believe in the strength of Divine Love and shared it with his people,” narrated His Beatitude. Then, according to his words, something happened that is difficult to humanly comprehend -- the power of love renewed this nation. “Divine Love gave wings to the human spirit of people and through the development of culture, the arts and education raised it to the heights of European civilization. It was specifically this power of love and the worshipping of this God, who is love, that created from the various tribes, the most mighty nation of that time in Eastern Europe. It is precisely the power of love that became the spiritual revolution, the transformation of his people and opened to them the road to the Heavenly Kingdom,” said the Head of the Church. He turned attention to the fact that even today we often see on these same hills of Volodymyr’s city the generations of the cult of force. “Some think that brutal, especially physical force, may be the means to solving social problems, that through force one can achieve the unification of our people or our nation or to conquer the respect of one’s neighbors. Some think that through force one can resolve one’s family issues and therefore so often violence blooms in Ukrainian families,” summarizes the leader of the Greek-Catholics. His Beatitude Sviatoslav also urged that we should beseech Prince Volodymyr who stands before the Divine Altar to pray for our Ukraine, for our nation, for our society, for our Church. “Let us beseech that the example of the Equal to the Apostles Prince Volodymyr become the example to follow for real Christians in Ukraine today. Then together with you, we can survive this spiritual revolution, the transformation of society which at one point Prince Volodymyr and his country underwent,” said the Head of the Church. On the Feast of St. Volodymyr in the Church the faithful traditionally renew the vow which is taken during the Sacrament of Baptism—the baptismal vows in which they promise “to live according to the commandments of God. “It is the spiritual manner in which we celebrate the Feast of Volodymyr,” reminded His Beatitude Sviatoslav. Therefore, the Liturgy was followed by the Rite of the Renewal of Baptismal Vows. We remind all, that on the occasion of the 1025th anniversary of the Baptism of Rus-Ukraine, His Beatitude Sviatoslav issued an Epistle to the faithful of the Ukrainian Greek-Catholic Church and all people of good-will.